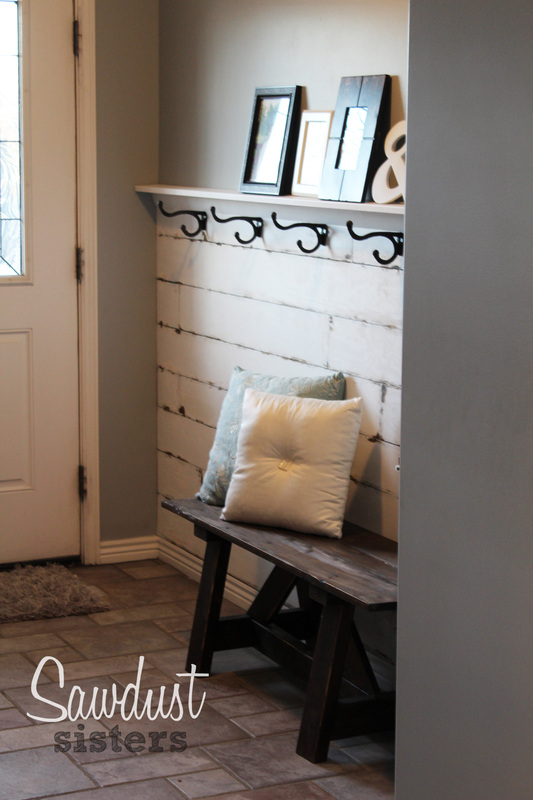 This beautiful DIY entry way plank wall allows you to create a shiplap look with inexpensive plywood ripped into 6″ planks. 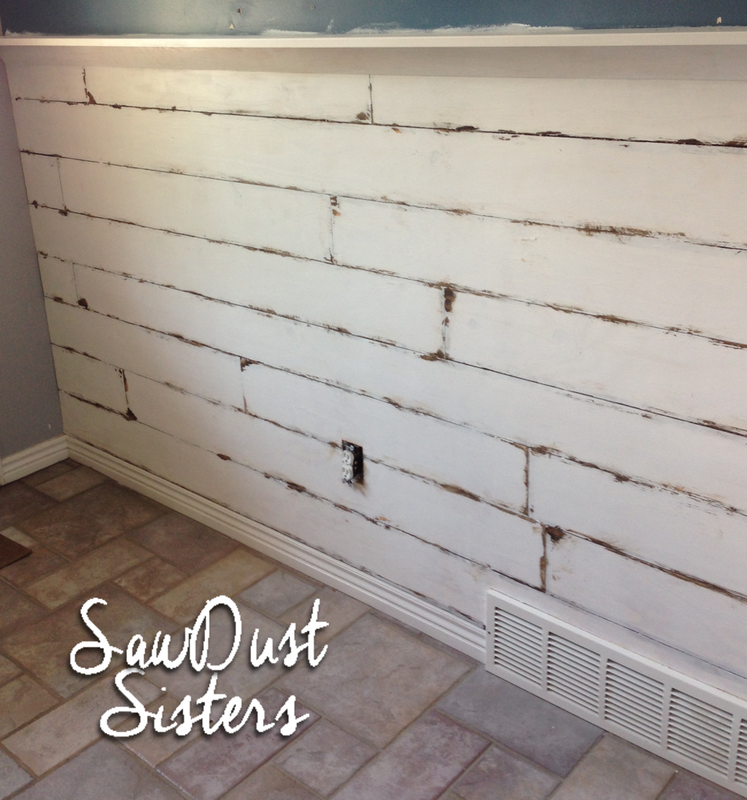 This project was inspired by Shanty2Chic You can replicate this look on any wall with inside corners. 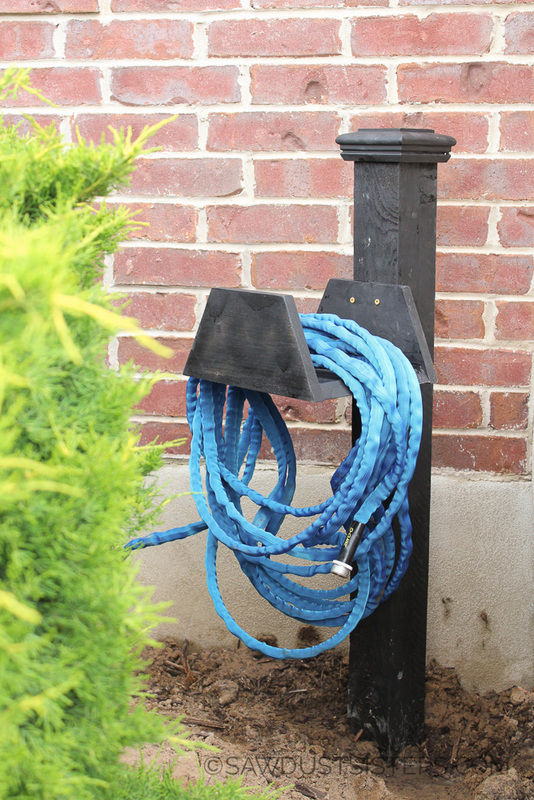 This was a pretty easy project I completed in one afternoon. 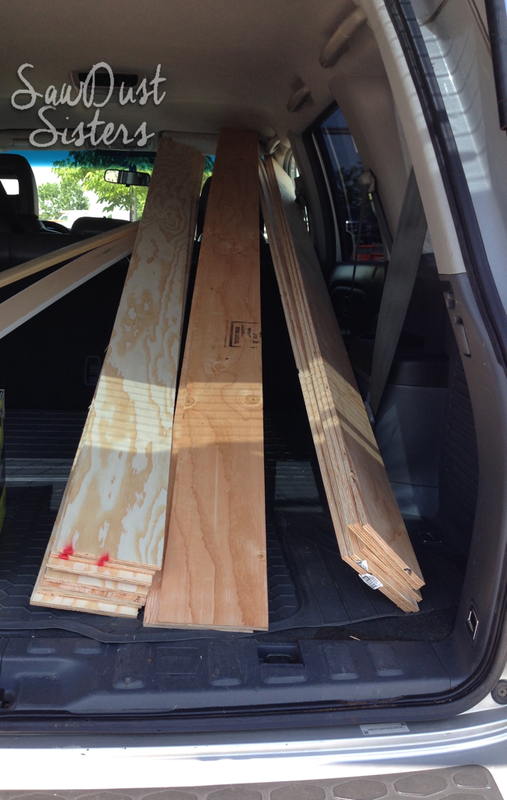 I went to Lowe’s and got 2 sheets of 1/4 inch 4′ x 8′ plywood. 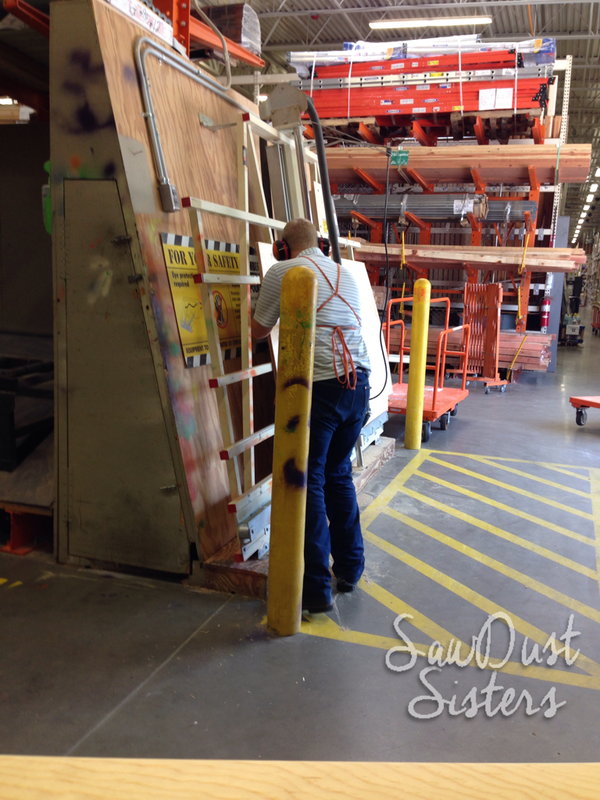 I had the nice guy working the saw slice both plywood sheets into 6″ planks. 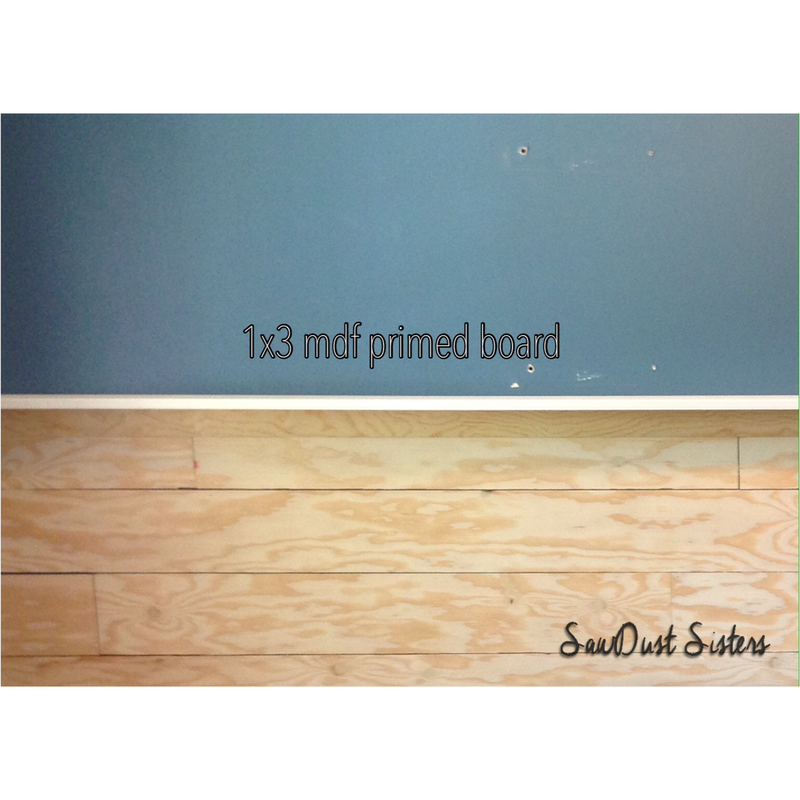 Because I did not want to remove the baseboards, I chose 1/4″ plywood. That thin width looked best against my existing trim. 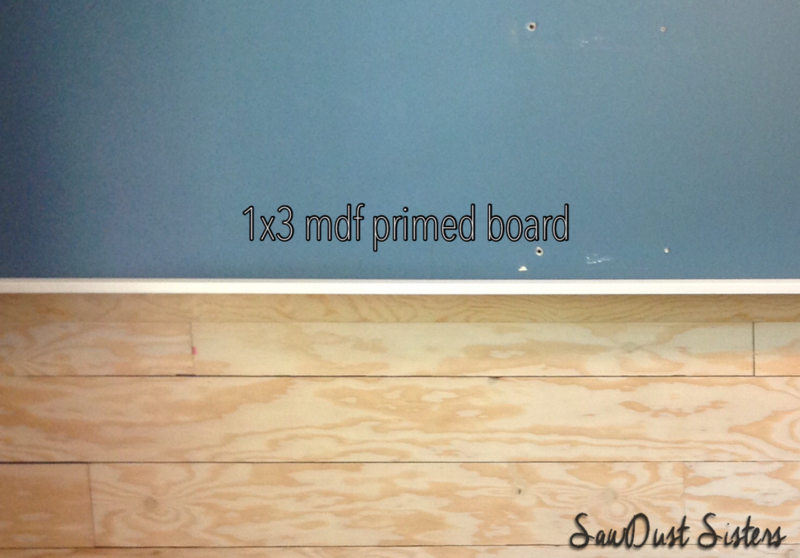 Ripping both sheets into 6″ planks gave me a total of 16 boards. I was on my way home in no time! 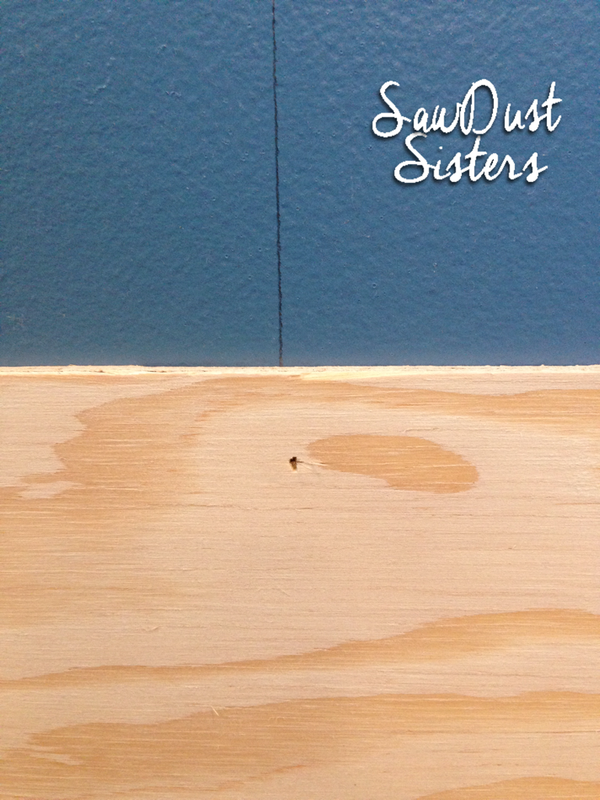 Using a Level and a Wood stud finder I drew vertical lines to mark the studs . 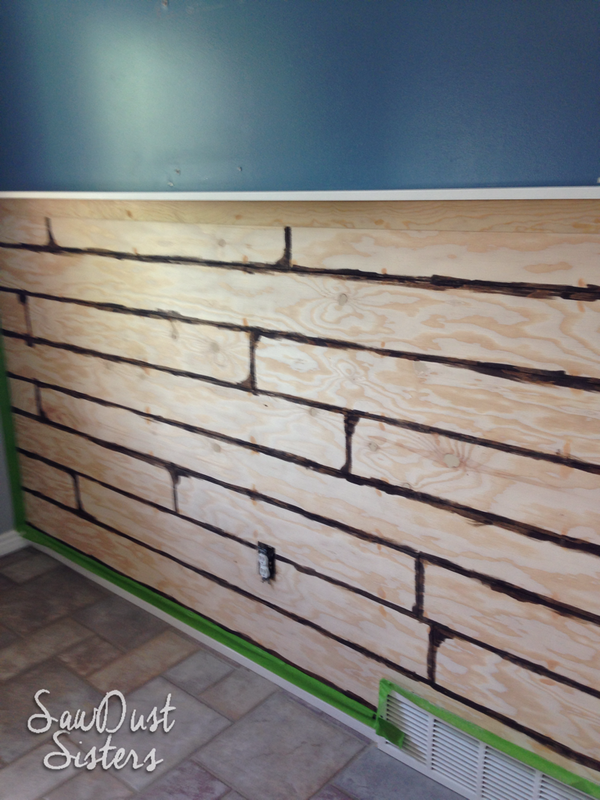 Draw your lines marking the studs a few inches above the overall height of the plank wall. That way you can keep an eye on where your studs are ask you nail the planks up the wall. I decided I would nail the planks rather than glue them, so they’d be easier to remove if I want to switch things up in a couple years, without tearing up the wall. My wall space is roughly 9′ wide. 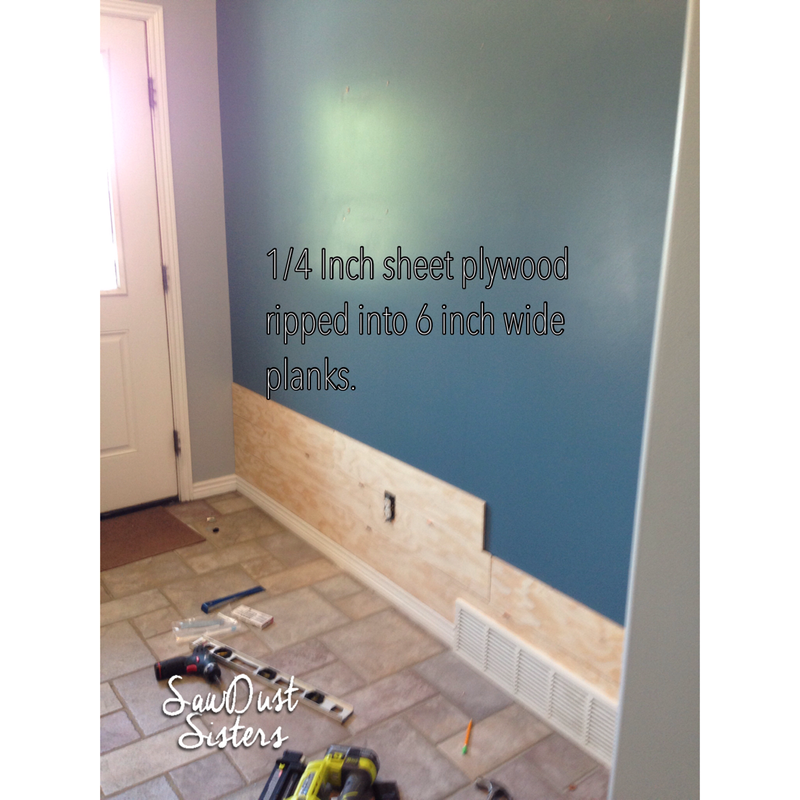 I used a whole plank on my bottom piece, plus a short one foot piece to complete the width of the wall. The long bottom piece was the hardest piece because I had to go around the cold air return. I marked the wood and cut around it with my Jig Saw . I did the same thing when I went around the electrical outlet. 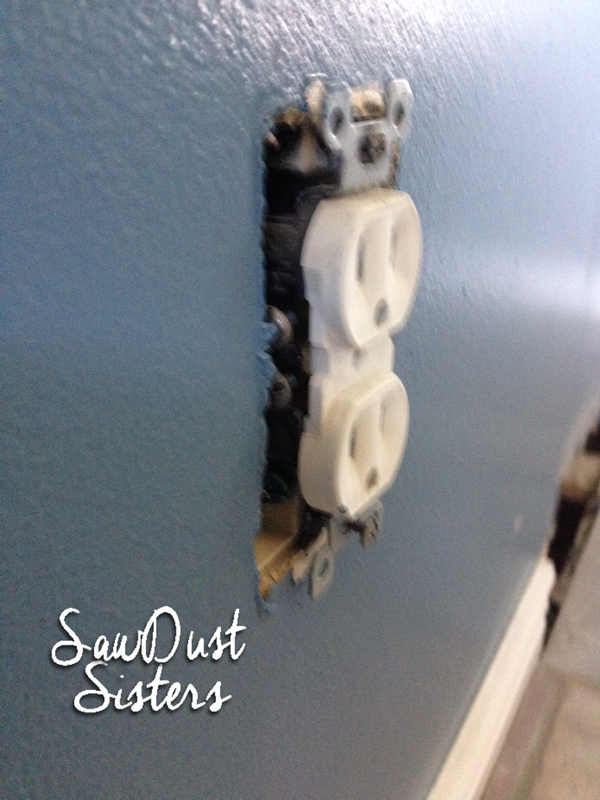 I took the cover off and unscrewed the outlet and let it hang a bit off the wall, so I could set the plank behind it. You will need to replace the existing screws of the outlets with longer screws.You can find them at any hardware store. Just ask!.Make sure you turn off the power brake while you are doing this. Safety first :). 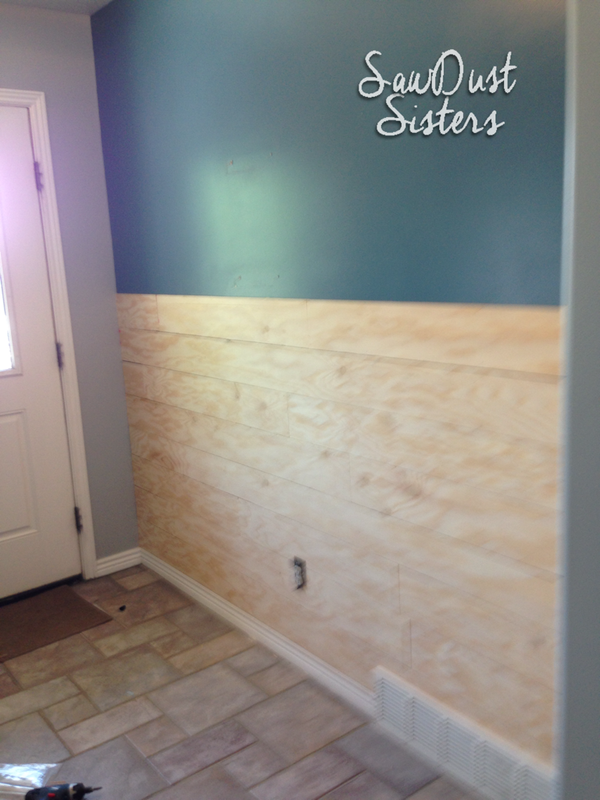 I secured the planks into the wall using my Nail Gun . 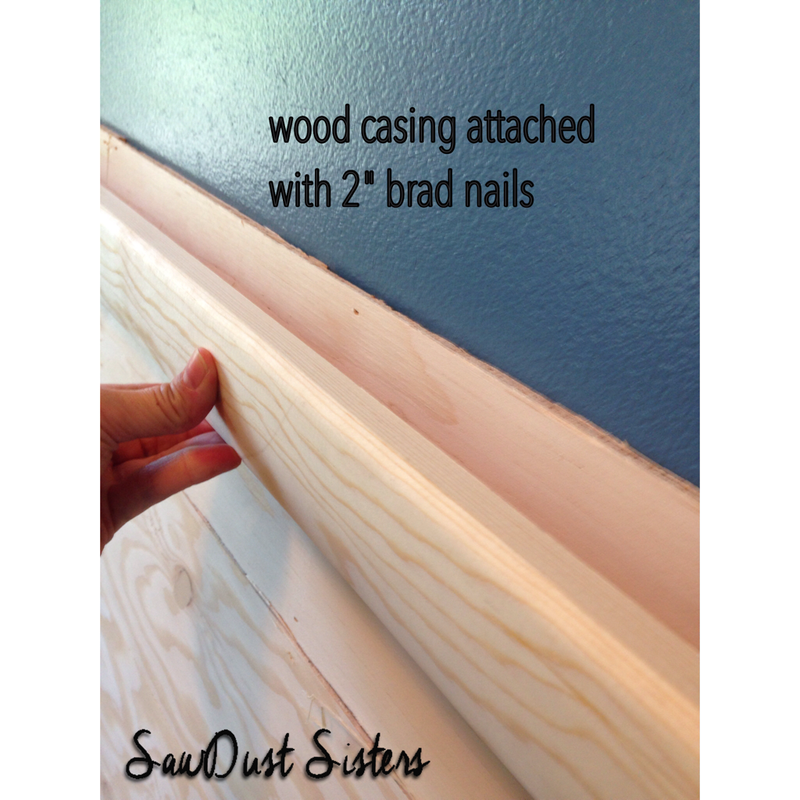 I shot 1 1/4″ brad nails into the studs. 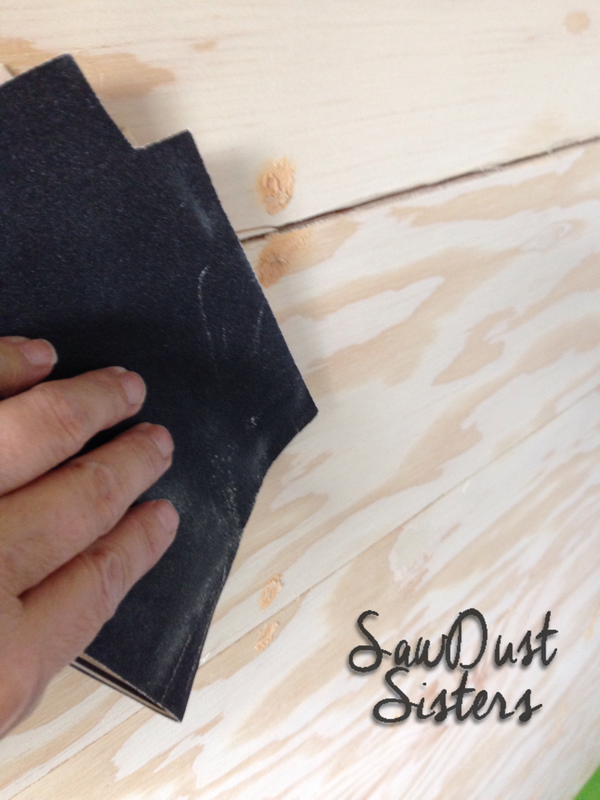 You will need longer nails if you use thicker plywood. I also used a Level to keep the planks straight as I went up. Once that first plank was on I cruised. I cut pieces randomly using my miter saw. I didn’t follow any particular pattern. I just kept cutting and nailing making sure the planks were level and that my seams were staggered randomly. I used pennies in between the planks as I went up to keep the same distance in between. Pretty soon I was half way up the wall and patting myself on the back 🙂 I decided to only do a “half” wall but this would look awesome all the way up too! Sorry for the blurry pic 🙁 I should’ve taken another! To finish up I cut piece of casing the width of the wall. I placed it directly on top of the last plank. I used wood glue and shot brad nails into the studs. Remember those lines you drew all the way up? They come in handy now to find the studs! I did use longer brad nails here, 2 inches. Lastly, I cut a piece of primed mdf 1×3 board the width of the wall and set it right on top of the casing forming a ledge (see pic below). 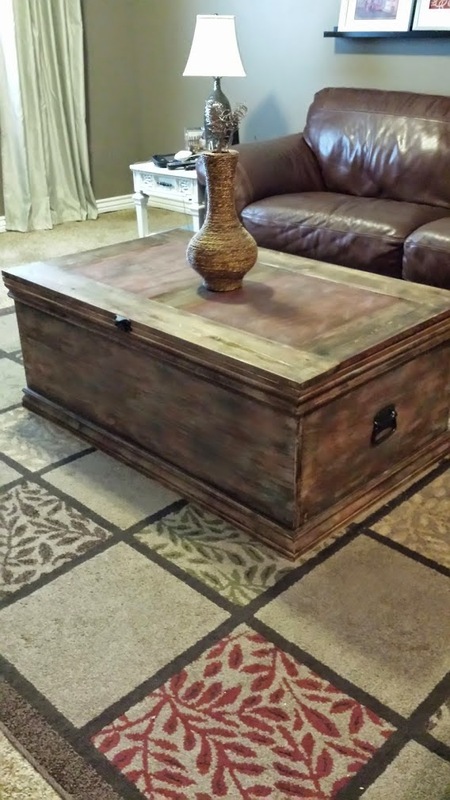 I used wood glue and shot nails from the top and into the casing in a few random places. Now the fun part. 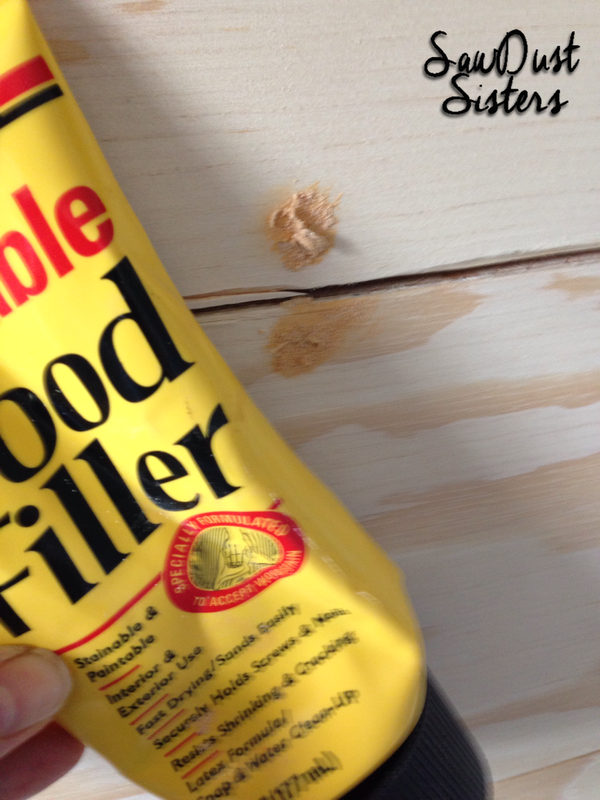 I filled the holes with wood filler . Once dry I sanded the wood lightly to smooth it out. 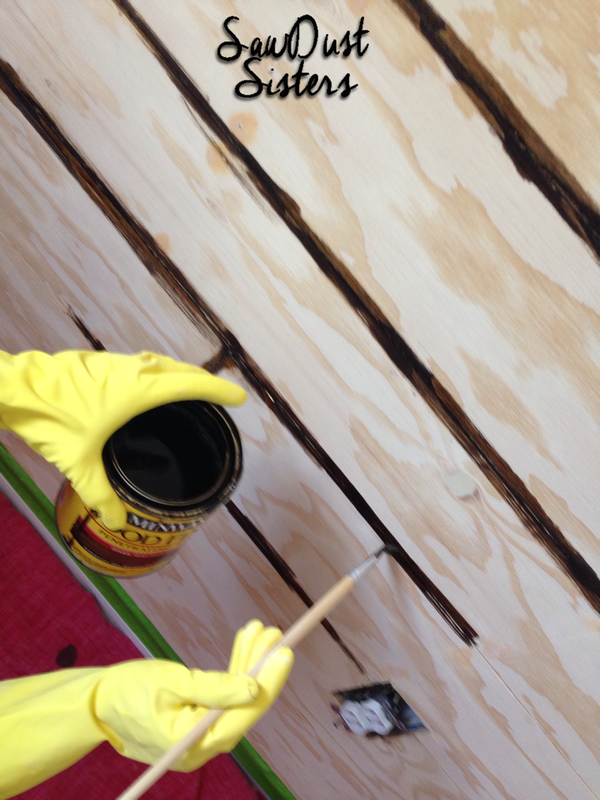 I then applied dark walnut wood stain around the edges of each plank with a small brush. I let the stain sit for 5 minutes then wiped off the excess. Almost done! After the stain dried I applied a thin layer of Vaseline in random areas with the intention of having the paint fall off in those areas once I sanded. 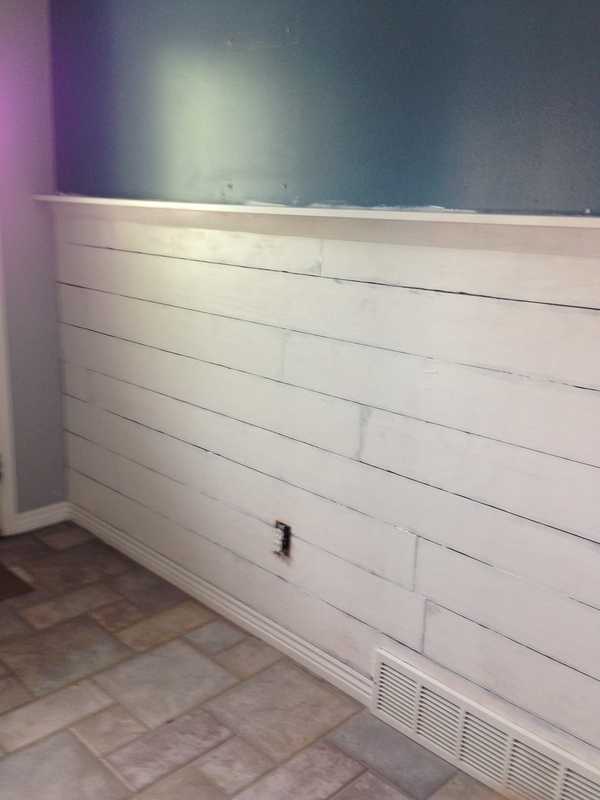 After I applied Vaseline, I gave the wall 2 coats of white paint. I let the paint dry for a few hours, then I sanded the wall and the areas where I applied the Vaseline fell right off. 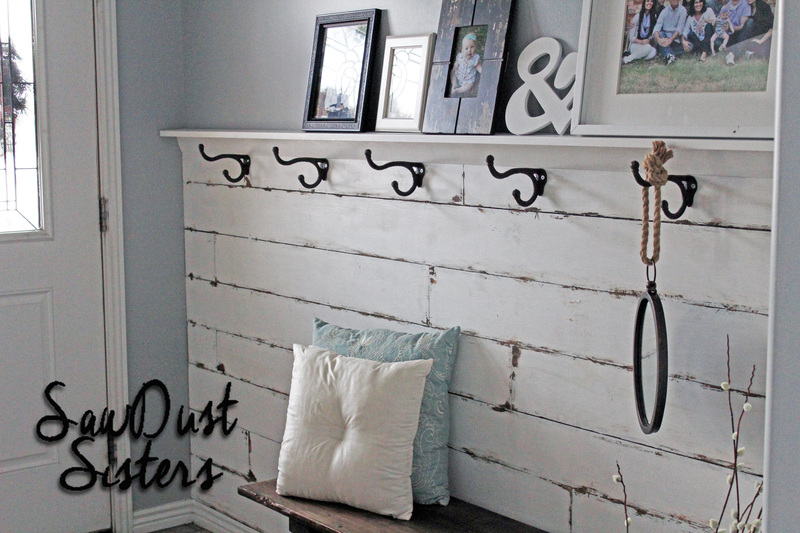 This gave it a fun distressed look! That’s it! Not too bad! 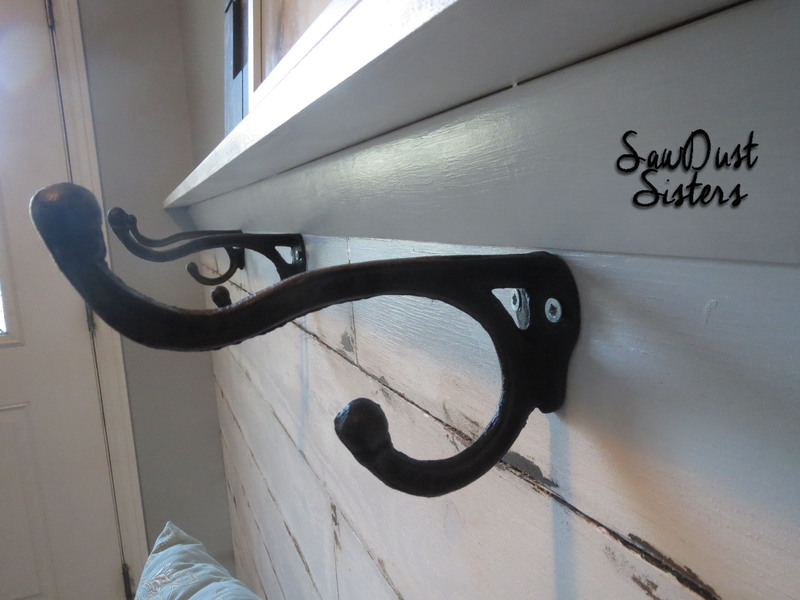 Finally I added these awesome cast iron hooks . Be sure and attach them to the studs. I used 3″ wood screws. 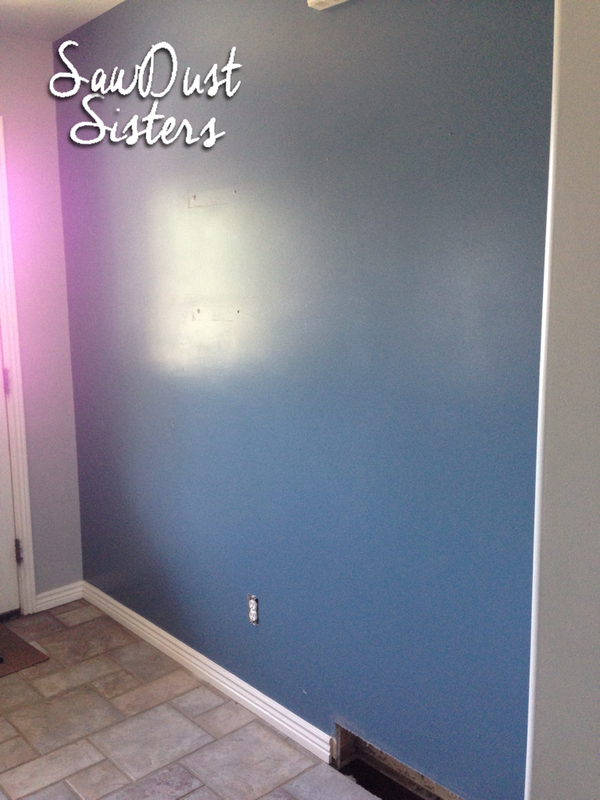 I also painted the top half of the wall grey to match the rest of the walls. Here are some pictures of the finished wall. I am so happy with how it turned out! 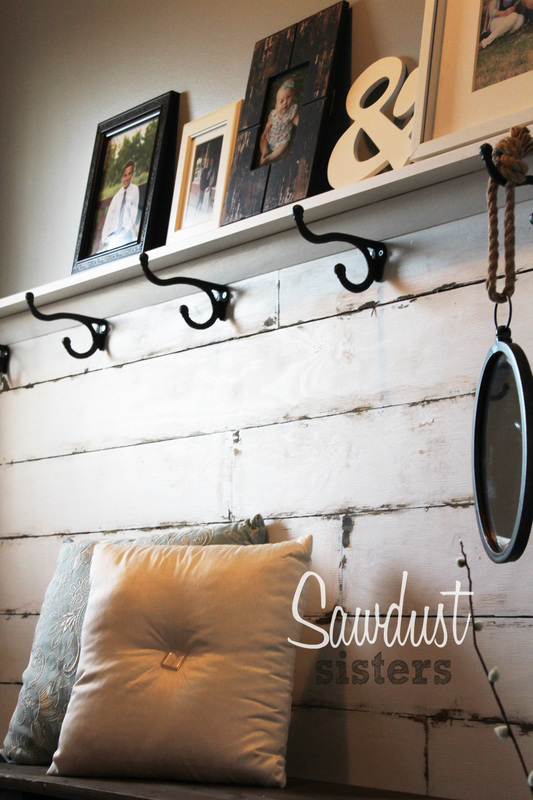 This wall cost me around $75 including the hooks. If you like the bench, check out the tutorial for it here! Here’s a quick video I put together to sum it all up! 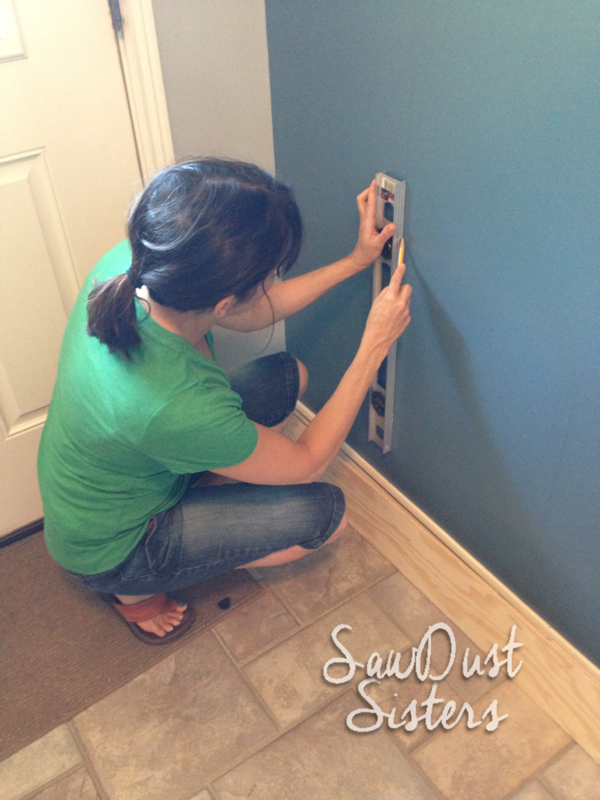 Did you use the same color paint for the wood planks as your baseboards? Hi Lori! I didn’t. I used paint I had on hand and it’s a little different shade of white, but given that the wall is distressed, it doesn’t look bad at all. What I great transformation, I love it. Well, ladies, I think your project turned out great! Good job! I love the way the wall looks like it’s been there for years. The little bench is adobes, too! Hi Megin!! Thank you so much. We appreciate the kind words and the feature!! I love this! 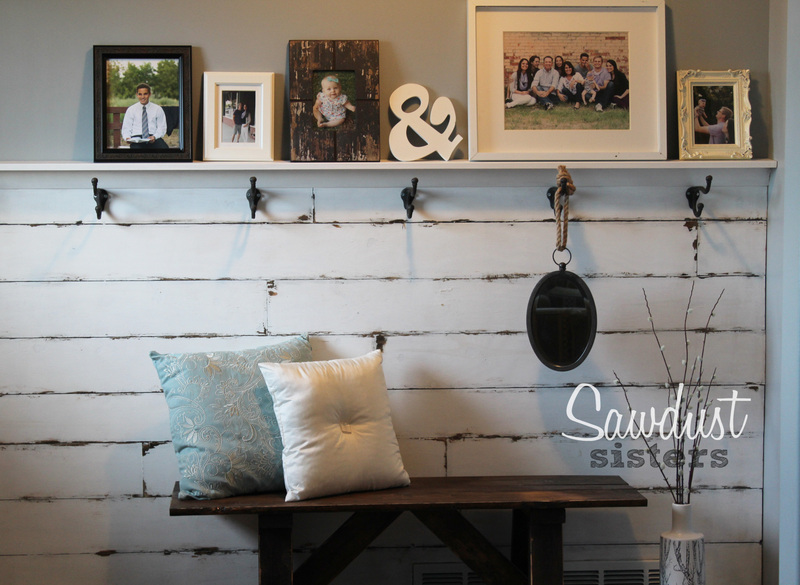 We applied faux shiplap to our fireplace surround last year, but we are getting ready to add some more wood for architectural interest and I am really liking this. I like the way you did the stain before the painting to give it some real character! I have pinned this and would love it if you would stop by and share this at the Celebrate Your Story! link party. If you have a moment, this is the link: http://celebrateanddecorate.com/celebrate-story-30/ I hope you will join us! Hey Chloe! Thank you so much for the kind words! I just linked to your party. I’ll have to take a look at your fireplace! I bet it’s gorgeous! That is a wonderful example of using plywood to mimic other wood products. I love your penny idea as well- I usually grab a random piece of cardboard when I need to space things, but the penny is a better idea, for sure. Thanks Melony!! I appreciate the kind words! Yes, pennies worked well! super tutorial! Lots of hard work paid off. Thanks Gail! Love your site!! This turned out amazing! 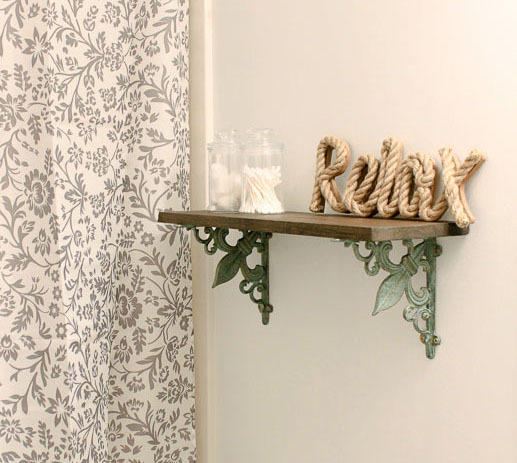 I love the distressed look and how you turned the whole feature wall into useable space with the hooks and small shelf at the top. Beautiful! Janice your wall came out fabulous! What a transformation!!! Thank you so much for sharing st SYS and enjoy a wonderful weekend! One of the most unique entryways I’ve ever seen! Thanks for joining us at Celebrate Your Story and have a fun weekend. This is the best $75 I have seen spent in a long time. The end result is truly gorgeous! Your photos and details make it possible for anyone to replicate it. I hope this gets a feature in a magazine…it deserves it. Thank you for joining our link party! Thank you Debbie! You are so kind! Awe!! Thank you so much Sam!! Thank you Seana! I’m glad you liked it! And thank you for stopping by! Thank you, Marjan! Yes this project is very do able for beginners! Thanks Judy! I’m glad you liked it! That was an awesome job Janice!!! I love the distressed effect! Thats’ my favorite! Thanks Anika! I appreciate you stopping by ! So nice! I love this. So in the write up you said it would work with a wall with inside corners. So you don’t think this will work on a wall without? I have a wall that is open on one end and had a closet on the other. What problems do you forsee me having trying to replicate this look? Not sure if you’ll be able to see the pic but I’ll link it here. I know this is an old post but it;s just what I’ve been looking for so I hope you are able to respond! Thank you! Take care. I don’t see the link to the picture :(, but actually, my in-laws did something similar to their entry way and their wall was open on one end. It looks good! You would just need a piece of wood trim to go along the open edge (vertically) so you don’t have the edges of the plywood showing up on the open end. Personally, I think it looks better on a wall with inside corners, but I was pleasantly surprised when I saw my father-in-law’s version. It was pretty cute! Good luck! i love this! Summer project for sure! what color is your living room wall painted? Hi Laura! It was called “silver grey” but I can’t remember the brand 🙁 I’m so glad you like it. 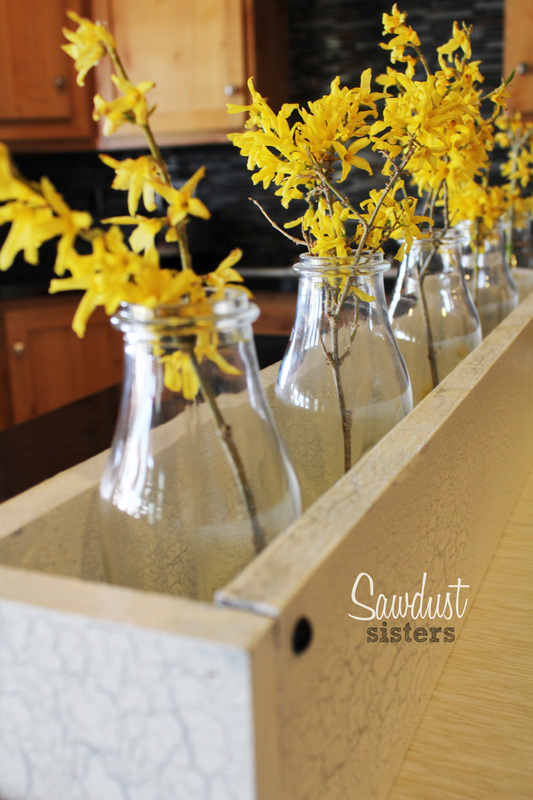 Perfect summer project! Love your project! 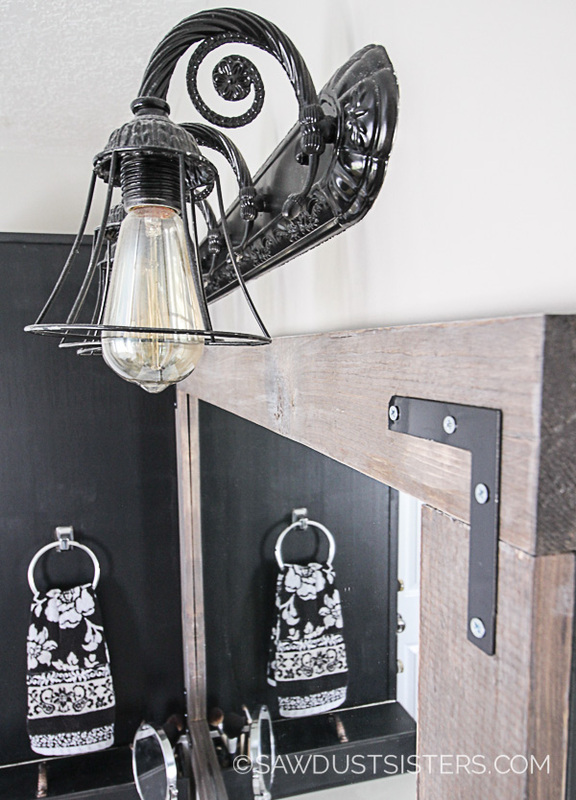 We shiplapped our front entry wall 3/4 of the way up, then attached industrial pipe coat hooks at the top for coats/bags. Ordered the Stay Awhile sign for top. Perfect! Thanks so much for the idea! That sounds, beautiful Kim!Thanks for stopping by! Good luck and I’m glad you liked the project!